Ariana Ost lets the natural beauty of 48 unprocessed diamonds shine through in this handmade piece. Meet the polished diamond's chill, naturally stunning sister. She's rough, with a raw, unprocessed beauty that makes her stand out. 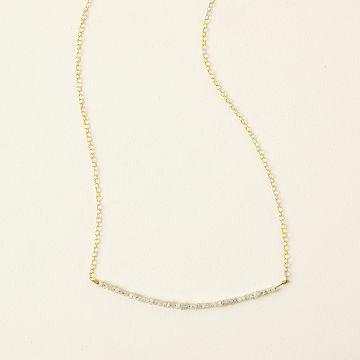 Ariana Ost strings 48 of them together on a delicate gold-fill chain, creating a necklace that works layered as well as on its own. White tee, little black dress—this timeless piece steals the spotlight without even knowing it. Handmade in New York City.